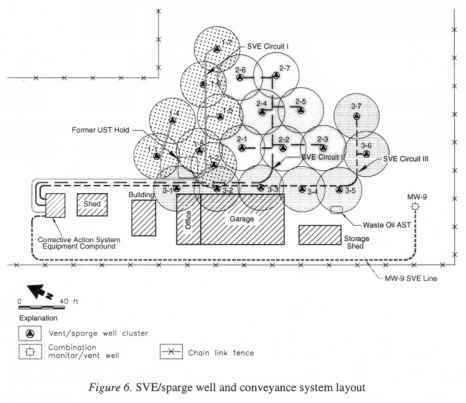 In December 1994, DBS&A submitted a corrective action system design that included 21 combination SVE/air sparge (AS) wells in three circuits of seven wells each (Fig. 6). The dual completion wells were laid out using the 20-foot ROI determined from the high-vacuum SVE pilot test results (Fig. 6). 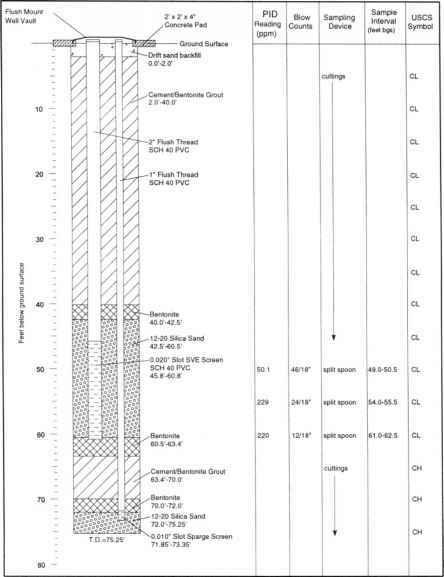 At each location, an SVE well with a screened interval ranging in length from 15 to 45 feet was installed, along with a separate 1.5-foot AS point installed between 10 and 15 feet below the water table (Fig 7). In addition to a control valve on each of the three SVE circuits at the main manifold in the equipment compound, each SVE/AS well was outfitted with control (ball) valves for both the SVE and AS components. The system also included a vapor treatment system consisting of an internal combustion (IC) engine fitted with a supplemental fuel source to destroy the vapors collected by the SVE wells. Driller: Pool Environmental Bit diameter 6 25 in, I.D., 10.5 in. O.D. NMED (DBS&A 1995). DBS&A's careful evaluation of site conditions resulted in cost savings to NMSHTD in excess of $200,000 on well construction alone. DBS&A further reduced construction costs by using a portable shed to house the IC engine and blowers and the assistance of NMSHTD personnel during construction. The NMED approved an operation and maintenance plan in November 1995, and DBS&A started operation of the SVE system in early December 1995. 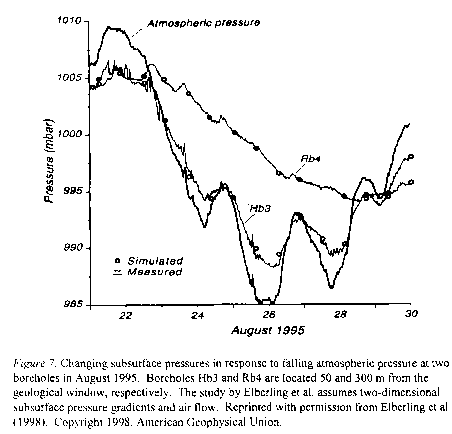 On April 29, 1996, monitor well MW-9 was incorporated into the SVE network to provide further control of the groundwater plume (Fig. 6).